This week, I’m facilitating a youth leadership workshop for students between the ages of 8-11. People often ask me how I’m able to teach emotional intelligence, which happens to be a very cerebral concept, to students who are still in elementary school. While there are several methods I use, perhaps the most effective is the use of stories. Rather than inundating them with pages and pages of information or lecturing at them for hours, I like to introduce a topic (in kid language), then use a story to reinforce it. Below are a few of the stories I use to reinforce the notion that your attitude, NOT your circumstances, dictates your mood. As a parent (or teacher), it’s easy to direct a child to “change their attitude,” but what we often fail to provide are the tools and strategies to do so. Stories help stimulate their imagination, ultimately empowering them to realize that their attitude is a choice. I invite you to read these stories with your child and use them as a foundation to build on this skill. Some days later, looking in the mirror one morning, preparing for her day, she saw that she had only two hairs remaining. “Hmm, two hairs… I fancy a center parting today.” So, she parted her two hairs, and as ever, she had a great day. A week or so later, she saw that she had just one hair left on her head. “One hair huh…,” she mused, “I know, a pony-tail will be perfect.” And again she had a great day. So it is with us. We build our lives a day at a time, often putting less than our best into the building. Then, with a shock, we realize we have to live in the house we have built. If we could do it over, we’d do it much differently. But we cannot go back. You are the carpenter. Each day you hammer a nail, place a board, put up a wall. “Life is a do-it-yourself project,” someone has said. 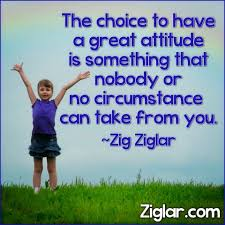 Your attitude and the choices you make today build the “house” you live in tomorrow. Please email me at mike@kaleidoeye.com if you’d like more examples of stories and/or video clips to reinforce the notion that attitude is a choice.